On the GED, you’ll encounter technologically enhanced questions. One type of question on the Reasoning Through Language Arts section asks you to correct, edit, or generally improve samples of writing. 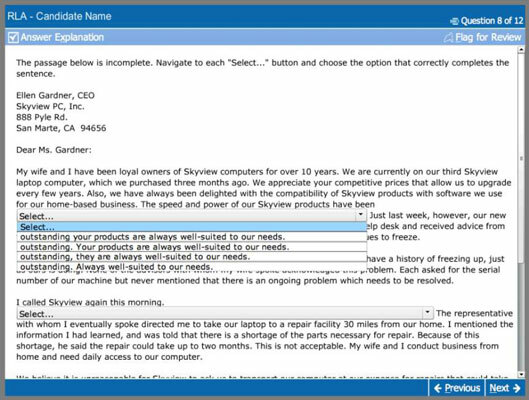 For some questions, the source text contains drop-down menus. In one line of the text, you see a blank space and the word Select… with an arrow next to it. When you click on that line, a number of variations appear for you to choose from. You pick the best choice as your answer. Here’s what you see when you click on the Select line. From the context of the letter in the item, you have to select the sentence that fits best and shows both correct grammar and correct spelling. Move the mouse to the proper choice and let go. The corrected wording will appear in the space as your chosen answer. You can now read the entire text to review and decide whether you indeed selected the appropriate choice. 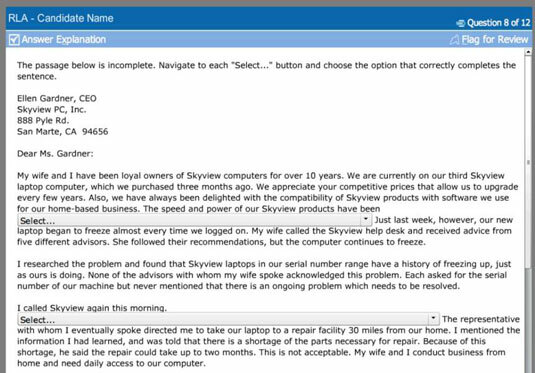 The drop-down menu may even ask you to choose only a single correct word. On the computerized GED test, you’ll have to click on Select to view the answer choices.